In this tutorial I will teach you how to configure the basic options for the BuddyBoss theme (version 3.0+). To view all of the options for BuddyBoss, just navigate through the other tutorials listed on this page. Create a new menu and add all desires pages into that menu. Drag and drop to reorder pages. Click “Save Menu”. Click “Manage Locations” and set your new menu to the desired location. 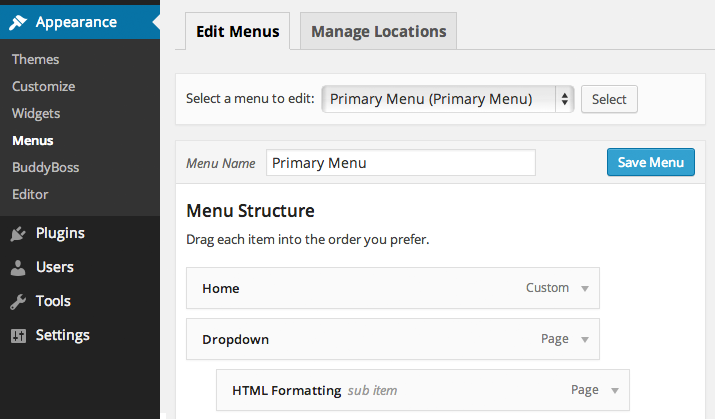 You can drag and drop menus into an indented position to get drop downs for the “Primary Menu” location. 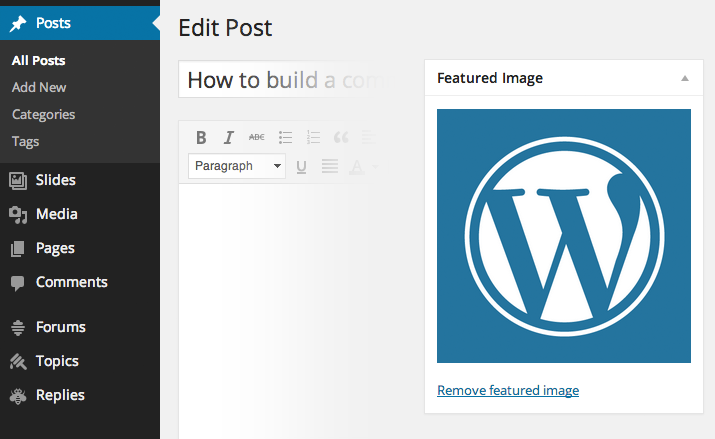 In the WordPress Dashboard, go to Posts and select a post to edit. Under “Featured Image” in the right column, click “Set featured image”. Upload your image into the media uploader, and then click “Set featured image”. Click to “Update” your blog post. By default, all new pages will have a comments box. You may want to change this behavior. From the front-end, navigate to the page you want to edit. Click “Edit Page” in the Toolbar at the top. Open “Screen Options” from the top and check the “Discussion” option. Scroll down on the page to the Discussion section, and uncheck “Allow comments”. This is only relevant if you are using the BuddyPress plugin. 1. Go to Settings > General. Select “Anyone can register” under Membership. 2. Go to Settings > BuddyPress > Settings. Make sure “Show the Toolbar for logged out users” is set to “Yes”. BuddyBoss comes with an attractive custom avatar that can replace the default WordPress “Mystery Man”. Go to Settings > Discussion in your Dashboard. At the bottom of the page, set Default Avatar to “BuddyBoss Man”. Install the “BP Profile Search” plugin. Go to Users > Profile Search. “Search Form Header” and “Toggle Form” are not relevant. Whatever you put in there will not be used as those options are only for the hard-coded option. BuddyBoss is using the widget provided with the plugin. Leave “Add to Members Directory” unchecked. We will be using the widget instead. Navigate to Appearance > Widgets. 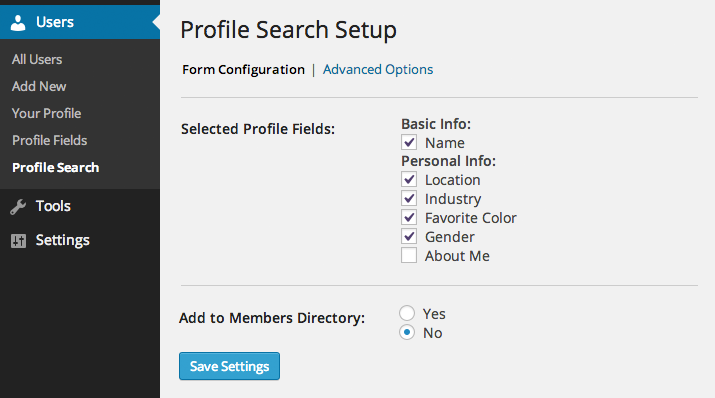 Add the “BP Profile Search” widget to your desired widget area (usually Members → Directory). Thanks for this theme which is very good!! This the only place for wich I can’t see anything. I have tried with many widget and still the same. Do you know how I can solce this as this left slidebar is bery important? Glad you like it! Please post this in the support forums and TJ should be able to help you out. Does Buddyboss allow me to set a featured slider on the home page (i.e. our home page needs to be more of a “pitch page” to get people to sign up as a member via a subscription agreement)? Does Buddyboss allow people to upload documents in the Group discussion section? how do i remove “Designed by BuddyBoss” from the footer? Copy the file footer.php into your child theme. Then open that file and delete the line that says “Designed by BuddyBoss”. i have the same issue, what program do you need to open the php, and once its deleted how can i implement the changes to the website? and which folder do i put it the footer.php file in? 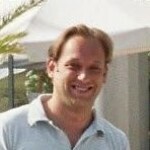 Put footer.php into the folder /buddyboss-child/ on your website on your server. awesome i seemed to have finally figured it out, i realized i was suppose to add the file into theme editor. I got another question now, i got a forums page, groups, members, and profile page, but when ever i click on them, all that comes up is a blank page, that you can comment on, As well as all the forums are only showing up on the home page and, it won’t let people register getting an error saying 404. thanks!! need to know how to fix this urgently. Reset your permalinks at Settings > Permalinks. Also make sure you have assigned the proper BuddyPress components to the pages you set up, at Settings > BuddyPress > Pages. i fixed the other problem too now, by deleting the theme and reloading it again. the only problem i have now is the forums page, i don’t have a forums page, when ever i type my websites name/forums it comes up in the home page. i try to make a separate page for it, but its url comes up as forums-1, it wont let me put in forums/. That means you probably have an old page with the URL “forums” already on the site. It may be in the Trash. Go to Pages > Trash and delete the old Forums page if there is one. Then rename the page you are using to have the URL (slug) of “forums”. Then in Settings > Forums, make sure to set “forums” as the Forums slug. how to make a member to publish a post, appears in the home as the latest news uploaded by each user, similar to facebook? When you say publish a post, do you mean an activity post or a WordPress blog post? To show blog posts on the homepage, go to Settings > Reading. Set “Front page displays” as “Your Latest Posts”. Your blog posts (created at Posts > Add New) should now feed into the homepage. To show the “wall” activity on the homepage is a bit more complicated. I would suggest posting in the support forums for that so our moderator can help you out. Random question and I can’t seem to figure it out for some reason but is there a blog template page in this theme? For instance the demo is showing the blog page with all the posts in order there. I’m somehow stumped on this one! Yes there is a blog template. 1. Go to Settings > Reading. 2. Set “Front page displays” as “Your Latest Posts”. 3. Your blog posts (created at Posts > Add New) should now feed into the homepage. 2. Set “Front page displays” as “A static page”. 3. Set a page you’ve created as the “Front page”. I’m an idiot – never mind! I notice that my logo is stretched on the login panel – what is the ideal image size? The ideal image size is 320 pixels wide at the maximum. Height doesn’t really matter. Wider than 320 pixels and it will not fit in the login panel. 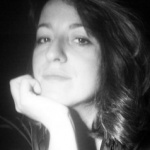 Hi, I love your work, i’m developing a new astronomy site with your theme right now. One omission though … unified search and BuddyBoss would really kick some a$$. There is no real solution for unified search as far as I know … can we expect this functionality? Hey Marc, thanks for the feedback. Unified search is not a top priority for us at the moment. We may add something like that in the future. In general I like to leave BuddyPress in tact as much as possible within the theme, to maintain compatibility with BP updates. Unified search would make a good plugin and there may be one out there. 1. Once iv purchase the buddy-boss theme, can I customize the theme using codes and various plugins? 2. Can I legally charge users to become a member, i.e. add Paypal and charge members a small fee. 3. Can I add adsense? 1. Yes you are free to customize it as you like. A free update coming out in January will add an admin section that lets you easily edit colors and fonts throughout the theme as well. Hey, I need the sample data for demo setup, where i can get that any idea or if you have so can you give me that..
1. can buddypress accomodate a million people and more? i mean if my website could have such a number of mmbers. 2. which hosting company is good to use if am to create a social network website? the one which could offer perhaps unlimited disk space. thanks and hope for your reply. 1. No, BuddyPress probably cannot handle a million people. If you did have 1 million people running on any social platform, it would take a huge amount of customizing and caching and a finely tuned server setup to make it work. Even at 50,000 people that will be the case. I don’t know of any open source social platforms that can handle 1 million people out of the box. That said, BuddyPress is free and a platform for 1 million people would be very expensive to make. So I still suggest using BuddyPress. If your community ever gets that big your site will be generating enough revenue to do whatever you need to do, including refactoring the site. The problem is that on a social website, your users are all hitting the database at the same time interacting with each other. Your site will crash with that many database queries and a default BuddyPress configuration. But again, there are solutions for this as you scale up. 2. My personal preference is KnownHost (affiliate link). That’s where this site is located, after having tried out several companies. The main thing you need is not really unlimited disk space, but rather a high performance system. Good CPU, lots of ram, fast hard drive, etc. KnownHost SSD options are awesome. Super fast read/write speeds and 24 core CPU on a server dedicated to your website = fast BuddyPress. They also have great customer support which has come in handy for me on a lot of occasions. am so sorry to take long, but thanks very much for your good response on my inquiry. i will glad to purchase a buddy boss theme very soon, i wish to at least get more than 45 members with time and expecting to grow. i thought unlimited disk space would matter but as you said that is doesnot matter then i dont have to worry about that any more. which means i have to get a high performance system from my web hosting right? i dont actually know much about this but according to your explanation, i hope to understand. No problem. Yeah, disk space is not a huge concern. Your member data is all stored in the database which is just text, so it will only get so big. Any host can handle the size of your database. Disk space becomes a concern if you have a TON of photos and videos and other large files. Yes a high performance system from your web host is ideal. But that’s also expensive. $50/month USD probably. You can start with something cheap for like $5 or $10/month if you want to save money. If you need to get better hosting as you grow, it is always possible to move the site. i need help regarding to the account activation, after registering there’s no email forwarded for activation. is there something wrong of renaming the slug name of the page? It is okay to rename the slug, but just make sure to confirm that the page is still tied to the Activation page. Go to Settings > BuddyPress and make sure that Register and Activate both have pages assigned to them. 1. can I and how do I change the size of the featured image for posts? I need them large, since my site is very visual. 2. I noticed that the member area does not show all the activity at once (like on facebook, or the activity page) . Is there a way to add a tab to the menu, that shows all the activity? Both the user’s and of other members? It can be a link to an activity page. I think it’s nice, people like seeing their content as a part of the community content. hello micheal, am looking for a buddypress plugin for ads or advertisement which can support payment system like paypal etc, the ads plugin that can allow many ads and let a customer to first pay and then fix his or her ad. Hi Michael!! I´m having a problem with the BP Profile Search. The issue I have is when seeing the search form from a mobile device, the title of the field is hidden by buddyboss. Could you explain me how to edit that? Thanks! Where do I go to edit the social network icons in the footer? If this is regarding the Boss theme please open a new support topic. 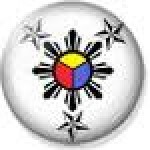 How can a member update his cover photo? Fernando we integrate with a plugin called BP Member Search. Download the plugin and activate. You may need to select options in the setting page to see the submit field. For further support you will probably want to contact the Member Search plugin author. Hello, l would like to change the favicon on my buddyboss theme, but despite the fact that l done it on my my web hosting files, the new favicon doesn’t apperas on my browser. How can l change the default favicon to put mine? John, your browser typically caches the favicon. Perhaps your issue has been resolved by now. Feel free to search our forums for this same issue. Loving this theme a friend of mine currently runs it, i’m considering buying it for myself for my next project… Top marks on the overall design and I see it runs smooth with “BuddyPress”. my question If I purchased a copy of this would it be possible to add widgets to the left panel/menu that opens and closes? I have a big project coming up for a Kinda Garden. And that would be ideal if possible. Could you direct me in the right direction about that please? Keep up the good work! Stephen, the theme does not allow widgets in the left panel, only menu links.